This is my second contribution to the Country View Challenges Design Team inspiration posts for this months challenge - Things With Wings. 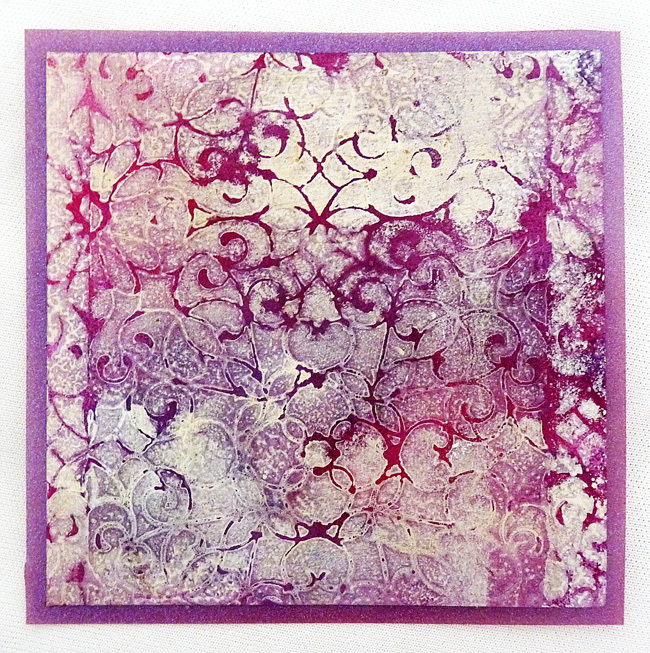 The background is one I made earlier in the week and posted up for my first Technique Tuesday post and I'm actually using the sample from that to create this card. First I experimented with sponging more card and stamping butterflies on it but it didn't give me the elegance I wanted so I went searching in my cupboard and found some translucent papers. 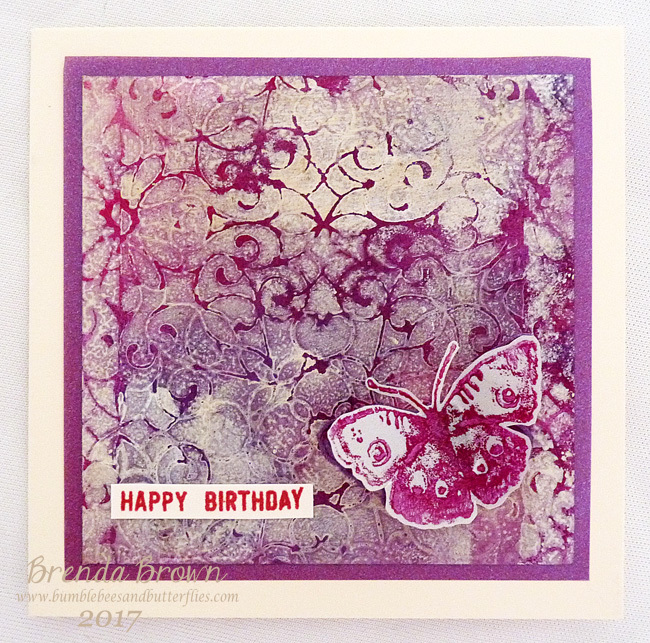 I took a butterfly from Tim's Watercolour stamp set and stamped the butterfly on both using quinacridone violet DecoArt media acrylic paint (the same as had been used in the background) and then cut them both out. I mounted the background on the darker of the two papers. I found a small greeting stamp to add the sentiment and made this into a card. I need to get some more things added to the Pack House space and this will do very nicely. Great background technique! The card is elegant and shabby chic at the same time! A really fabulous background and butterflies. 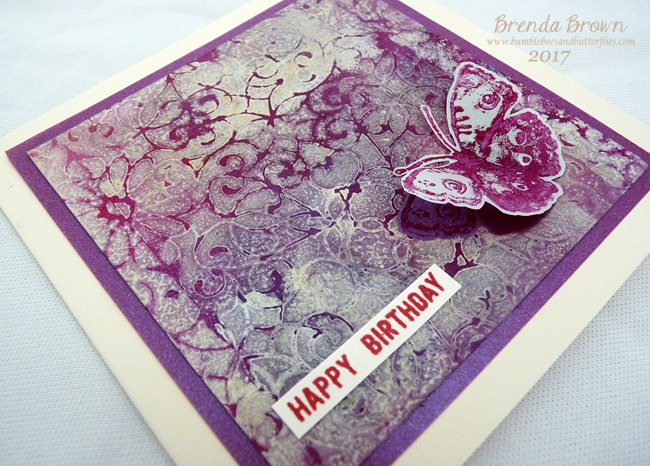 Your card came out beautifully with the addition of that butterfly! Love that background--I had a peek at your backgrounds in my e-mail yesterday, but my computer was not loading blogs for some reason...I'm off to see the details while it's working today! I think this is going to 'fly' out of the Pack House! Hugs! Beautiful background with a pretty butterfly! That background you'd previously made is so gorgeous. Adding the butterfly and simple words is Just enough detail. A beautiful card! Great card and a fabulous background Brenda, thanks for the details in TT. Your card looks very elegant! The butterfly and the words are really enough here - wonderful! Fabulous card using your TT sample. Love how you have allowed the background to shine with just a simple addition of a butterfly and sentimnent .